Is it possible to do a compression test with the engine out of the bike using a jumper starter power box connected to the starter motor? I didn't do a compression test before starting this major overhaul and I'd rather NOT reassemble if I don't have too. I did it on mine after a complete rebuild just setting on the bench and oil in the engine..
Had 140 psi dry and cold on all 4. Good to put back in. Thanks for the info. 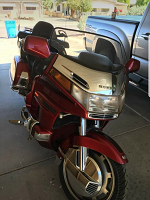 I see you've had several Goldwings... was it your GL1000 that you did the this on? Any suggestions you can give me? Is there any instructions on how to do a compression test anywhere? A compression test is fairly simple. Remove all the spark plugs. Take the compression tester and push it firmly into the spark plug hole, to make sure you have a tight seal. Have an assistant hold the throttle wide open (to prevent air resistance in the throttle from affecting compression numbers). While holding it tight, use the starter to spin the engine for a few seconds. Read the number off the meter, then press the meter's release button to release the pressure from within it. Repeat for each cylinder. That will give you your dry numbers. You then squirt a tablespoon or so of oil into each cylinder through the plug holes, and repeat the compression tests again. This will give you your wet numbers. In an idea world, your wet and dry numbers should be fairly similar. If your dry numbers are significantly lower than your wet numbers, it can indicate worn piston rings (the oil temporarily seals them up and makes your compression numbers go up). All four cylinders should ideally have similar compression numbers. Thanks for the instructions... I'll do this before putting engine back in frame! While looking for instructions on how to do a Compression Test I found this web-page... Thought it might help other newbie motorcycle mechanics like me! I have done compression test on all kinds of engines from a chain saw to a big block. I have never had a closed throttle affect the reading. Just not enough air flow at cranking speed to matter. Rule of thumb is 10% variance between cylinders.